"...after a medical journey that included far too many misdiagnoses, she discovered she was allergic to 95 different foods and food additives, ranging from wheat to caffeine, nitrates to sulphites. And much in the same way she transforms her fear of spiders into art (which she wryly names after food additives), she has turned her long narrative of frightening hallucinations, feelings of non-reality, anxiety, depression and something like the flu — together with the attempts to treat her symptoms — into an impressive book of poems, entitled Water Window Mirror..."
2014 Prix Aurora Award for Best Speculative Fiction Poem--Eileen Kernaghan! 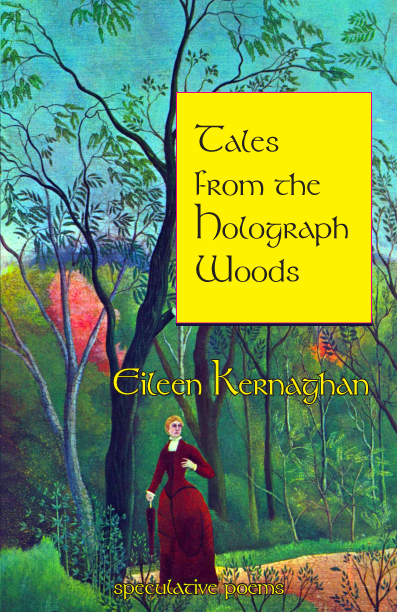 Congratulations to Wattle and Daub Books author Eileen Kernaghan who this weekend won the 2014 Prix Aurora Award for Best Poem or Song in English for “Night Journey: West Coast”, published in Tesseracts Seventeen: Speculating Canada from Coast to Coast to Coast, EDGE (2013). For more of her excellent speculative poetry, her collection Tales of the Holograph Woods: Speculative Poetry can be ordered here.